Mesquite trees might want to stand and wave to their admirers for the role they played in Tucson receiving that honor. They have been the most important of all wild food plants ever foraged from the Snorin’ Desert in and around the Tucson Basin. Over the decades, centuries, and millennia, they consistently provided more calories to the Indigenous inhabitants of the Tucson Basin than corn had ever offered to humans in such a desert clime. 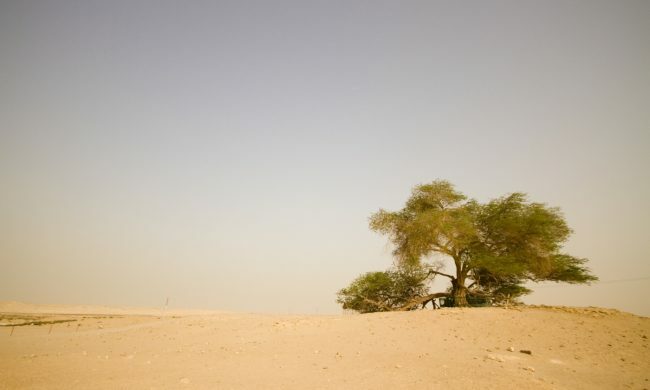 Large mesquite tree is seen standing alone in middle of Bahraini desert. Of course, for every current, there is a countercurrent. You might say that Laurus and I had finally bonded with our very own Mesquite Splinter Group. Those of us who decided to come together at the Mesquite Festival might well have been the largest gathering of Prosopis promoters in the history of humankind. You might say that we have come out of our closets to attend the annual meeting of the Sacred Order of Unconditional Lovers of Mesquite Trees. We suddenly realized that we were not alone. We were in a forest of friends. Of course, much of the time, the mesquite still goes unnoticed and unloved as it goes about its duties of serving our community. Its humility is such that it seldom even claims to be a tree, for it is just as happy being called a shrub, a bush, a switch, a simple member of the monte or desert scrublands that carpet much of this Land of Little Rain. Regardless of its often-diminutive stature, mesquite looms larger in the hearts, minds, and bellies of us border anarchists. For the last decade, it has been annually honored here at this community festival, which persuasively reminds local residents of mesquite’s many values and uses, as well as recounting the many former abuses it has suffered. The Tenth Anniversary Mesquite Festival was destined to become one of the best and largest ever hosted by the Desert Harvesters, a group that might be likened in their fervor to the Harry Potter tribe or to Deadheads. Other than being certifiably loco for legumes, they are an impassioned and intelligent collective of wild food foragers who live primarily in the Snorin’ Desert. 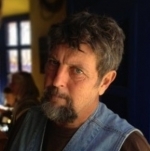 They include individuals who have spent years championing the renewed use of a variety of wild native foods that grow side by side with mesquite trees or beneath the same canopy cover: cholla cactus buds, quelite greens, and bellota acorns. The Desert Harvesters assert that these are the foods that we will survive upon after the Aquifer-Depleting Apocalypse. They can be produced on only six drops of rain and the single ash flood or snowstorm that the desert annually provides. For this reason, mesquite is their manna. Many of our fellow Desert Harvesters proudly accept the moniker of “wild foragers” in reference to themselves, and not just in reference to the native plants they put on their tables. Believe me, this crew is a resourceful bunch. They’ve figured out how to take dust baths and use waterless toilets. These guys know how to throw great pool parties without even needing to get wet. Some of them even attend the all-night orgies of lickable toads that unexpectedly appear when a whopper summer thunderstorm makes the streams flow for the first time in a gazillion years. And yet, if you observed our body language, you might notice that Laurus and I appear as though we are stunned, if not shell-shocked, by finding so many kindred spirits in one place. And we are enormously grateful and surprised by the many ingenious ways our community has been embracing mesquite and its myriad products. These tree huggers really know how to squeeze a tree for all it’s worth. When I first moved to Tucson more than 35 years ago, a festival like this to celebrate mesquite would have gone over like the proverbial fava bean in church. In the old days—aquel tiempo—it was more likely for my neighborhood to host a boat race in a dry wash, like the one we called the little Rillito River Regatta. Or we’d gather publicly only for the annual cholla cactus joint toss, where we’d pass around a few cactus joints for good measure as well. Simply put, in those days, mesquites got no respect from either the rural or the urban sectors of borderlands society. At best, they were considered firewood. Nothing like having your entire image and societal value based on being dead: deadwood. Back then, mesquite trees were blatantly abused. I could feel their pain, but hardly knew what to do. There were hardly any plants rights activists back then. I can still remember how they were disparaged and vilified. Ah, yes, it was as if a mesquite was Lucifer made manifest in the Legume Family. “The Devil in a Woodpile,” as an old song goes. I am suddenly reminded of mesquite’s days of suffering low esteem by an elderly woman who has come up to our Taco Diplomacy Food Wagon to check it out. She is in festive regalia, with faintly bluish hair and Western-style cowgirl attire. I am perched there in the wagon, hawking 1-pound bags of sweet flour ground from the sun-dried pods of honey mesquite. The wagon itself is made of thick planks cut from velvet mesquite trunks salvaged from trees in a desert area bulldozed for highway widening just north of Tucson. I watch as the elderly lady touches the richly colored boards, lightly sweeping her thin, bony fingers around the swirls of a blond knot in the midst of dark red and brown rings revealed by cutting the tree trunk into boards. She picks up a bag of mesquite pod flour. She slowly reads on the label that its pods were harvested by Seri Indian hunter-gatherers who live half a day’s drive south into Mexico. She sets the bag back down on the counter and pauses thoughtfully. She then tips the brim of her straw cowgirl hat up so that I can see her pale blue eyes peeking out from wrinkled, suntanned cheeks. They are laughing, dancing eyes. This elder is clearly bemused. “Well, I’ll be. I’ll be damned. I’ll be damaged. Eating mesquite. Imagine that. I can tell you one thing for sure. When I was growin’ up, they didn’t pick nor eat the beans off any mesquite tree. They poisoned them trees. They dragged them down with chains running between two bulldozers, driving in tandem across the range. They grubbed those suckers out of the ground until their roots was upright, danglin’ in the dry air. They do, indeed, change. Sometimes, for the good. It was true enough. Even when I began to apprentice myself to mesquites at the age of 23, I too knew that mesquite was not the blessed sight for most Arizonans that it was for me. And yet I knew a few innovative minds who could already see mesquite in a different light. Still, I could hardly work up the courage to tell some of my neighbors that I made my (meager) living wandering barefoot across the desert floor at dawn, tallying up the number of ripe mesquite pods per tree. If I had argued with them that the mesquite forests deserved some modicum of protection, they would have hoisted me up in a Hangin’ Tree. In other words, I had good reason to be a clandestine bean counter … or pod counter, actually. I had not yet come out of the mesquite wood-paneled closet. But I already knew I was going against the grain. No doubt my neighbors believed that both this tree and I had fallen from grace. They likely feared we had gone over to the Dark Side of the Desert Forest. Needless to say, even today people are not of one mind about mesquite in the Southwest. We have been historically infected by some sort of leguminous schizophrenia. It’s even spread into patches of Mexico and other parts of the world where Prosopis grows, from Honolulu to Ouagadougou. Mesquite has come to divide the tree huggers from the graziers from the hatchet men. But it’s not like separating the seed from the chaff, or pitting good against evil in some primordial passion play. Each of these groups has its virtues and its varmints, its assets and its asses. To some extent, the Mesquite (Culture) Wars have continued unabated unto this very day. To the north of my present home in Patabutta, a few ranchers still wrap them in chains and grub many of the shrubby sort out of the ground, while judiciously leaving a few good-sized trees for shade and browse. I don’t mind such practices all that much, as long as the wood goes into fireplaces or furniture, which it does in this case. But to the west of me some 50 miles, I once walked through a ghostly patch of dead mesquite trunks where the Bureau of Indian Affairs had aerially sprayed the desert vegetation with the same herbicides that had been used to defoliate the jungles of Vietnam. Thank God, most of those herbicide treatments did not work all that well, for the bushes resprouted within a couple years, so most ranchers abandoned that practice. But what, if any, was the impact on the health of the Native foragers who gathered firewood and the edible pods of the mesquites sprayed there? What that elderly cowgirl from the Lone Star State had alluded to was true. She had minced no words. She was absolutely correct in admitting that a War of the Woods has raged like a wild fire from here clear to Car-Nation. Some of the mercenaries in that war have been hell-bent on annihilating mesquite, but they had no better luck than U.S. troops did in North Vietnam or Afghanistan. I am not disparaging our troops. I’m just conceding that our political readers have misread the landscape and put lives at risk by doing so. Isolated skirmishes still and will flare up from the Chihuahuan Desert lands of West Texas to the Mohave in Southern California. Mesquite trees have been subjected to chain-saw massacres, bulldozer scrapings, tar and featherings, drownings in motor oil, controlled burns, and Agent Orange-spraying frenzies on hundreds of thousands of acres, as if they were no more than worthless weeds. And yet here we are, me and that elderly cowgal from Big Springs, shaking hands and hugging, four decades after the War on Mesquite reached its zenith. We both are glad it is behind us. And now we are surrounded by dozens of Mesquiteers of all ages who are poised to purchase oodles of mesquite flour, jelly, and honey. But so many people from all walks of life at this Mesquite Festival are not present simply to partake in a feeding frenzy. Some of them pray that mesquite’s nutrients and chemoprotective substances will keep their diabetes and heart disease at bay. Others consider its timber to be our highest-quality wood for crafting guitars or smoking bison meat for barbecue. Still others hold out the hope that it will become our greatest ally in sequestering carbon to slow the rate of global climate change. Nor is the Desert Harvesters’ Mesquite Festival solely about the economic value of this xerophytic shrub. I would assert that it is an indicator of the early onset of xerophilia—the contagion of love for, of, and in the desert. In fact, the festival foments a broader expression of xerophilia, an unconditional love that embraces all that punctures, pricks, sticks, and stings. From the window of the Taco Diplomacy Food Wagon, I see vendors selling syrups, soaps, jams, fruit leathers, and barbecue sauces made from the fruits of the giant saguaro cactus and the lowly prickly pear. Others are offering the desert’s most potent healing herbs such as creosote, range ratany, limberbush, and yerba mansa in potions, plasters, tinctures, teas, and salves. Still others market raw foodstuffs or dried spices gathered from the desert floor—from Sonoran oregano to chia seeds—for all these plants grow amidst the mesquite-studded hillsides and floodplains of the desert borderlands. We have come to learn that over the centuries, our predecessors and ancestors found ways to gather these healing herbs into medicine bundles, cabinets, pantries, and larders where mesquite gums and saps, meals and seeds, had also been cached. In short, this love fest for mesquite is both a Woodstock and a Feedstock for the Snorin’ Desert as a whole. As I pause and listen, I hear O’odham Indian fiddle music in the air, drowning out the drone and thump and putter of hammer mills as they pulverize mesquite pods into the finest of flours. A half-dozen more millers have shown up with their machinery to grind the pods that participants have harvested over the previous months gratis. And because of all the roasting and milling being done on the spot, the barrio air is sweet and smoky. 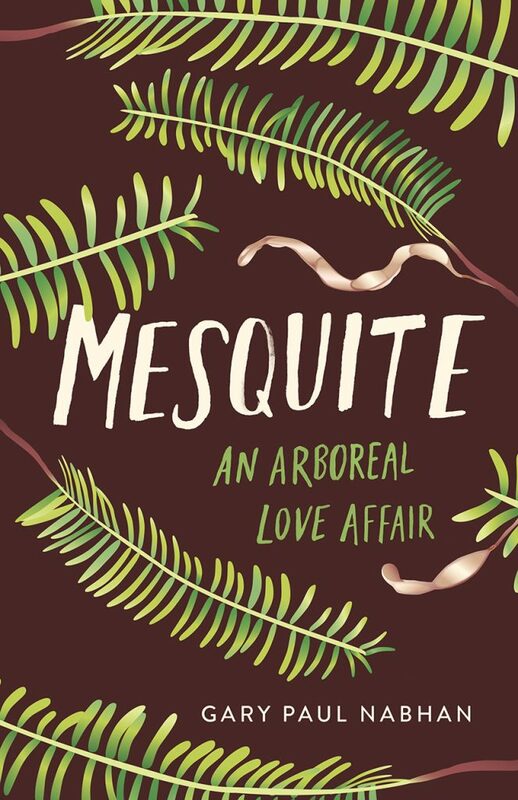 This adapted excerpt is from Gary Paul Nabhan’s Mesquite: An Arboreal Love Affair (Chelsea Green Publishing, 2018) and is reprinted with permission from the publisher.